Mount Rinjani National Park is the one of the famous, beautiful and challenge adventure destination in the world, covers an area of 41,330 ha on the northern part of Lombok. Named after Indonesia’s second highest volcanic peak outside of West Papua, the peak of Mt Rinjani (3,726m) dominates the landscape. Within the crater is the spectacular Segara Anak lake and the still-active volcano Gunung Baru (2,363m). It is surrounded by a further 66,000 ha of Protection Forest and covers the four administrative district of West, East, north and Central Lombok. The park ecosystem is in the transitional zone between Asia and Australia (Wallace zone). Average rainfall is about 3,000 mm annually. Gunung Rinjani is rich in a variety of flora, fauna and vegetation types. On the south western side of the mountain is the most eastern extent of primary rainforest in Nusa Tenggara. This gives way to monsoon forest and drier climate in the east, and savannah in the north east. Notable flora includes the everlasting edelweiss flower, Tiger orchid, grass, Cemara trees and Casuarinas occidental. Mt. Rinjani, one of the over 40 National Parks throughout Indonesia, was established in 1997. It is valued and protected for its spiritual as well as natural values, and is worshipped by thousands of Balinese as well as Sasak pilgrims. Hot springs near the crater lake are sought after for their healing powers. Over 20 villages surround Rinjani and there are many routes up the mountain, but the main access is from Senaru in the north and Sembalun Lawang to the east. 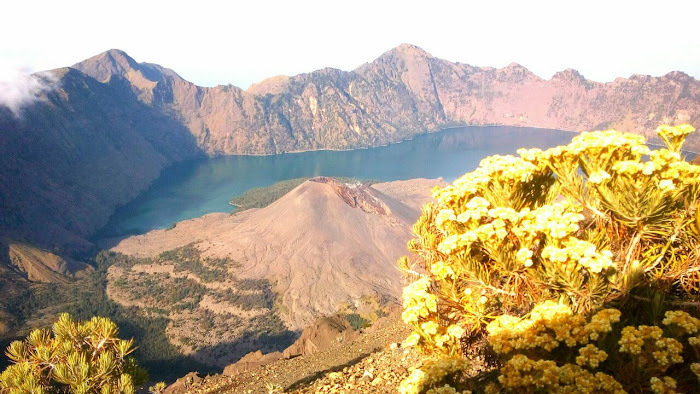 The challenging three-day Rinjani Trek route from Senaru to the crater rim, down to the stunning crater lake then on to Sembalun, is considered one of the best treks in South East Asia. Those heading for the summit usually prefer to start in Sembalun. The village of Senaru and Sembalun is the main gateway to Mount Rinjani National Park, the most popular start point for the three day Rinjani Trekking up Indonesia’s second highest volcanic peak (3,726m). For the people of Lombok, Sasak and Balinese alike, the volcano is revered as a sacred place and the abode of gods. Within the spectacular crater, the Segara Anak Lake is the destination of many pilgrims who place offerings in the water and bathe away disease in the nearby hot springs. Developed with New Zealand Government assistance since 1999, the Rinjani Trek Centre embodies under one roof the unique partnership of the National Park, tourism industry and local communities that has been forged to manage and protect the Rinjani mountain environment. Beware of bad weather and risks of exposure to the wet and cold. If caught in an electrical storm, take shelter and avoid prominent ridges. Beware of snakes, and stinging insects and plants. Leeches can be a nuisance in the wet season.